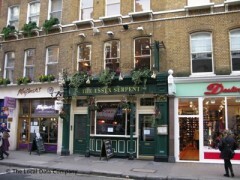 About: The Essex Serpent serves a wide selection of drinks including beers and spirits. They also have Sky TV and a quiz machine. It can also cater for private parties of up to 50 guests and has three function rooms which are separate from the main bar and restaurant areas.